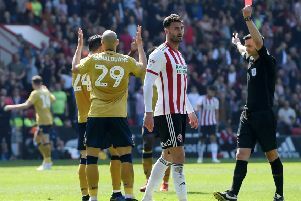 Sheffield United manager Nigel Adkins has confirmed he plans to sign a new centre-half before the end of the transfer window despite lavishing praise on Jay McEveley and Neill Collins. Adkins made the admission after insisting his team are guaranteed to score goals after recruiting Billy Sharp and Conor Sammon from Leeds and Derby County respectively. McEveley and Collins, who was frozen-out by Adkins’ predecessor Nigel Clough last term, have forged a formidable partnership throughout United’s pre-season campaign which concluded with a 1-1 draw against Hull City yesterday. The visitors included former Croatia international Nikica Jelavic and Uruguay’s Abel Hernández in their squad but Adkins told The Star: “Jay and Collo have both had excellent games again. They look very solid and it’s good to see that partnership developing. “We’ve looked strong defensively against Hull, who were in the Premier League last season, and Newcastle who also put a very strong side out. I know we are going to score goals. We’ve got that repertoire and an array of good attacking talent. Sammon missed the meeting with City due to a prior engagement arranged before is arrival from Derby County last month. Adkins, who revealed Jose Baxter was withdrawn after “getting a knock on his knee” during the second-half of a contest which saw Hernandez cancel-out Jamie Murphy’s opener, is thought to have consolidated his interest in two potential targets, both of whom have competed at Championship level of late, despite indicating McEveley and Collins are in pole position to start Saturday’s League One curtain-raiser at Gillingham.